6 Weeks Out from Harvest Family Hoot April 6-7! That’s right y’all! Before you know it, the weekend of April 6-7 will be here, and you KNOW where you should be – HOOOOOOOOOOOOTENANNY!! I am grateful to still be able to bring quality live music to the community, and the Harvest Family Hoot is a celebration of that continuation. It’s been a long strange trip for the last 20 years, and I look forward to what the future brings on this level. (Blue Ridge) HarvestFest, the 19 editions of TDawg’s Back Porch Hootenanny that followed, the Annual Holiday Hootenanny, the free community events, and all the TDawg shows over the years in and around the Southeast have all had a strong common bond in the amazing talent that has always come together to produce memorable and transcending music experiences for just a few patrons or a few thousand and all points in between. Similar to the final Back Porch Hootenanny in 2016, this upcoming Harvest Family Hoot is bringing together musical talent that spans the history of TDawg Presents from 1998 to the present. I am honored that all the musicians involved have been a part of the journey – we’re in for a weekend of sit-ins and jams that will leave you right where you need to be! The band closing the The Shed Stage (scroll down for schedule), Deep Blue Sun, is known for their amazing jams and musicianship, and you can rest assured they will leave nothing on the the table at the Hoot! Below is a video from the 4th Annual Atlanta Holiday Hootenanny featuring some special guests, Jeff Mosier and Bobby Miller among them, who will be present at the Harvest Family Hoot. Please note the use of only one hand playing bass 😉 You can expect more of this in six weeks, and more! Enjoy! Hootenanny Artist Preview: Curtis Burch, and a little music history, too! I have been fortunate enough to build not only music relationships but also long-lasting friendships with some pretty amazing musicians, and one of those, Curtis Burch, helped pave the way for much of the music and musicians I love. Click on the link below for a cool video featuring Curtis on stage with Sam Bush Band down under the oaks at Spirit of Suwannee Music Park a few years back. As a founding member of the legendary band, New Grass Revival, back in 1972, Curtis Burch is regarded – along with fellow bandmates Sam Bush, John Cowan (joined in 1973), and the late Courtney Johnson – as a pioneer for the music known as “newgrass” then and “jamgrass” today. Combining elements of jazz, rock, blues, and bluegrass, NGR defied all that was traditional then. Burch, aka Dr. Dobro, left the band in 1981 along with banjoist Johnson, due to touring weariness. Before they departed however, NGR toured internationally with Leon Russell, backing him on dates worldwide and firmly establishing themselves as a top tier act. By the time Curtis was a teenager, he was hook on the dobro having heard Flatt & Scruggs w/ Josh Graves, who is widely regarded as the inventor of the resonator guitar. His family had moved from Alabama to Brunswick, Georgia, and he met a dobro player from Milledgeville, GA, named Tut Taylor, who is also a great bluegrass legend and one of the greatest dobro players ever. Curtis moved to Nashville around 1970, and while working at a banjo/guitar shop co-owned by Tut Taylor, Randy Woods & George Gruhn, had met the great Norman Blake. Through Blake, he was able to enter the studio scene and met Sam Bush, who at the time was a member of Bluegrass Alliance. Curtis joined the band for a spell, which also included Courtney Johnson on banjo. For many reasons (good ones I’m sure!) they left Bluegrass Alliance and formed the band New Grass Revival. In 1973 and after a couple of lineup shuffles, the great John Cowan (currently the Doobie Bros. bassist) joined the lineup and the rest is amazing music history. Collaborations with the late, great John Hartford, Norman Blake, Leon Russell, and many others dominated their slate, not to mention their annual pilgrimage from the outset to a little festival known as Telluride Bluegrass Festival in Colorado. Much more recently, Curtis has recorded an album with Larry Keel, and he has continued to play out with Keel, David Via, and others. He still teams up with Bush and Cowan when the timing is right! Burch also won a Grammy, participating on a dobro compilation produced by Jerry Douglas called The Great Dobro Sessions in 1994. Rest assured that the two sets featuring David Via alongside Curtis followed by Larry Keel & Natural Bridge is going to set off some serious fireworks on the Shed Stage! I wouldn’t be surprised to see much of the same in different formations on the Grateful Fred Stage. HOOT HOOT!!! ADVANCE TICKETS for FRI-SAT and SAT ONLY are available now at the links below. ***All advance purchases will receive a copy of a compilation from TDawg Presents’ 2nd Annual Atlanta’s Holiday Hootenanny that occurred in December of 2012, featuring Papa Mali, Larry Keel, Oteil Burbridge, Jimmy Hall, Rev. 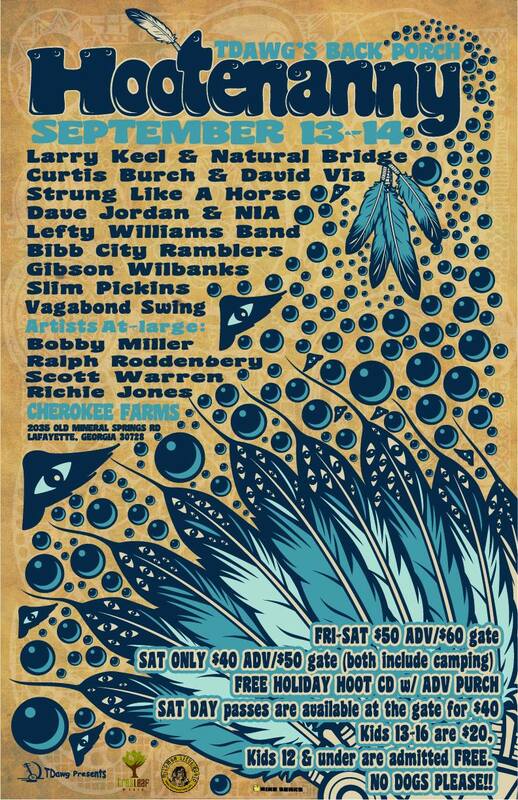 Jeff Mosier, Col. Bruce Hampton, Ike Stubblefied, Grant Green Jr., Deep Blue Sun and more! SAT DAY passes are available at the gate for $40. Kids 13-16 are $20, Kids 12 & under are admitted FREE. NO DOGS PLEASE! !